Social contract: Summarize the views of Thomas Hobbes and John Locke. Social contract is giving up rule over oneself and granting it to a single ruler. The social contract theory concept came to being as a result of oppression and hardships in the society. Man entered into two agreements; Pactum Unionis and Pactum Subjection is to overcome the problems. The first, Union is people sought protection of their property and lives, and as a result, a society of respect for each other and harmony was born. Subjection is, on the other hand, is where people united, and together they pledged to obey the authority and surrender whole or part of their rights and liberty to the authority. The authority in return would guarantee the protection of lives property of everyone to a certain extent. Therefore, people and the authority agreed to live together guided by common laws and create an enforcement mechanism for the social contract and laws which constitute it. The authority came to being due to the two agreements. Thomas Hobbes 1588- 1679 lived at a crucial time in England when there was a clash between the King and his supporters, the monarchists and the Parliamentarians led by Oliver Cromwell who demanded more power. Hobbes believed that in a society people living with no authority, people only act on their self-interests. He gives a clear illustration by giving a hypothetical situation of the way things were prior the authority, in his words, life was solitary, nasty, poor, brutish and short. He described the society without authority as the state of nature, and it was “war of all against all.” Molarity was not in existence, and everyone lived in fear, but the most plenteous was fear of death, made eminent by the violence that surrounded the society. People, therefore, gave up on the sovereignty to the “Leviathan” and embrace peace in the social contract. “Leviathan” who is a ruler as defined by Hobbes is bestowed upon, the power to enforce renunciation of violence by the subjects. The ruler may even use force against the people as long as in the long run peace is obtained. He maintains that the purpose of the authority is to impose and maintain law and order and prevent any form of violence. He was therefore in support of the King but against the theory of Divine rights of a king which states that authority is bestowed upon him presumably by God. John Locke, on the other hand, lived between the years 1632 and 1704. His argument on the state of nature and social contract are quite different from that of Hobbes. He argues that the social contract and the right of people to revolt against the authority were a huge influence to democratic revolution that followed the founders of the United States, Thomas Jefferson being one of them. According to him, the state of nature is pre-political but not pre-moral meaning that the state is not as depicted by Hobbies as a state of war but that of liberty and one that everyone is free to pursue their interests. He envisions a less frightening natural state, where people live in freedom, but very chaotic. People, therefore, decided to give up some of their liberty to limit chaos and regulate life. The act, however, did not give the rulers the absolute right to control people only to enforce the safety of their lives and property. The people have the right to overthrow the government if it is no longer capable of fulfilling the agreement. 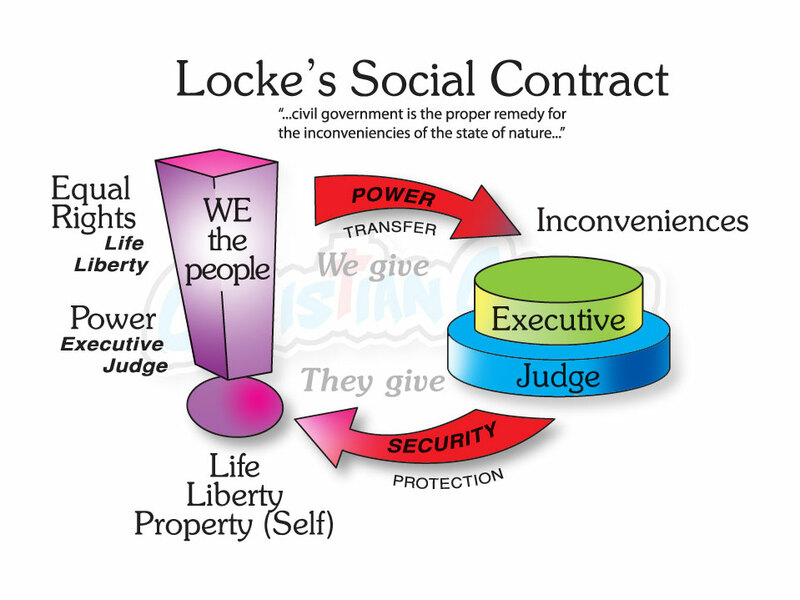 In my view, John Locke’s model of the social contract is in use in the United States. Reason being, people have the right to freedom. The government acts as a source of security for everyone, be it financial, security of people’s lives, property and much more. People have the right to vote for the leaders they wish to rule them. The leaders do not have an absolute say; they stand to be corrected by the citizens of the nation.